Sonoma Bach’s mission is to bring together and nurture a community of music-lovers in our beloved Sonoma region to share in the magnificent experience of early music. We know that this music from the distant past—sacred and worldly, vocal and instrumental, solemn and joyful—can speak powerfully to today’s audiences, and we reach out not only to those already familiar with its pleasures and beauties and traditions, but also to those for whom the music is brand-new. Our resident ensembles—including three vocal ensembles and our period-instrument orchestra—prepare and perform an annual series of eight concert sets, featuring the finest repertoire presented in imaginative programs designed to bring to life the magic of the music and to connect compellingly with our audiences. Most of our concerts take place in the Green Music Center’s 240-seat Schroeder Hall, with its live acoustics, intimate audience experience, and wonderful Brombaugh pipe organ. 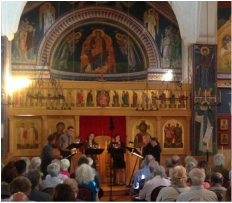 In addition, we offer site-specific concerts designed for special places in Sonoma County, such as our annual concerts in the domed and frescoed Church of St. Seraphim. Sonoma Bach offers a variety of opportunities for learning and exploration for singers, instrumentalists and listeners alike. Our classes, workshops and lectures focus upon four broad areas: Individual skills (such as vocal technique and sight-reading); ensemble skills; knowledge of repertoire; and ‘the big picture’: What does it all mean, and how can I connect? We believe passionately in the power of music to bring people together, to help us work through life’s challenges, and to serve as a catalyst for positive change. When people make music with and for each other—with skill, with style, with love—we believe that our world becomes better. Sonoma Bach is proud to have been serving our community for 25 years through this essential activity of music-making, and we look forward eagerly to continuing our efforts for many years to come. The Sonoma Bach Choir is a group of about 50 gifted singers drawn from throughout Sonoma County. The Sonoma Bach Choir specializes in the music of the Baroque period, with special emphasis on Johann Sebastian Bach; members and audiences alike thrill to the constant inventiveness and incredible degree of feeling in Bach's music. Our programming demonstrates both our diversity and our ultimate focus on the Baroque. Circa 1600 is a chamber choir, focused upon the nexus between the Renaissance and the Baroque. The group’s primary repertoire is drawn from the 16th and 17th centuries, with occasional forays backward to the 15th century and forward up to and including the music of JS Bach. Guiding lights include Josquin Desprez, Claudio Monteverdi, and Heinrich Schütz. Green Mountain Consort was founded as a one-on-a-part ensemble specializing in Renaissance music. This group is featured each season in our Sacred Realms concert set, held in the domed and frescoed church of St. Seraphim Orthodox Church. ​Live Oak Baroque Orchestra is Sonoma Bach’s resident instrumental ensemble. Led by Baroque violin sensation Elizabeth Blumenstock, LOBO brings sumptuous tone and breathtaking flair to the one-on-a-part string-band repertoire of the 17th Century. Experience Baroque music at its finest—passionately performed by some of the country’s finest and most charismatic period instrumentalists, right here in Sonoma County.